Anita Silvey has spent more than thirty years in the children's book field, including eleven years as editor-in-chief at the Horn Book Magazine. She is the editor of Children’s Books and Their Creators and the author of 100 Best Books for Children and The Book-a-Day Almanac. "...the brevity of this title, along with its notes and resources, make it an excellent choice for reading aloud and discussing in American history classes. Just add the music." 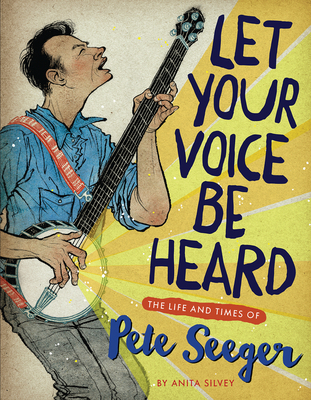 "With the engaging, well-illustrated biography Let Your Voice Be Heard: The Life and Times of Pete Seeger, author Anita Silvey explains how this unlikely folk-music hero turned singalongs into social change." * "A lively, unique contribution to the biography shelves." "Silvey provides well-supported, well-rounded context for Seeger’s moral stances, personal life (including his wife’s supportive role as his manager), and enduring claim to folk-song fame..."
"A fine introduction to a musical icon." "Through personal interviews, as well as primary source materials, Silvey creates a flowing biography for the middle school audience."